Nevin: “I hope that you have not got it in your mind that I am implicated with the ghost“. Detail of Walch’s Map of Hobart 1893 showing the area where the “ghost incident” took place on December 2nd, 1880. On the evening of December 2nd, 1880, photographer and Town Hall Keeper Thomas J. Nevin was arrested by his nemesis Constable John Blakeney in retaliation for Blakeney’s demotion in October 1880 when Nevin reported him for being drunk and asleep on duty at the Hobart Town Hall. Nevin was released by his friend Detective Connor and the charge was dismissed of acting in concert with a person pretending to be a ghost. That person, the one who is mentioned several times in this account, may have been Nevin’s colleague at the Town Hall Municipal Police Office, the Information Officer Edwin Midwood, father of cartoonist Tom Widwood. The upshot of this incident was Nevin’s dismissal from the Town Hall position for inebriation while on duty, and the “GHOST”, possibly Edwin Midwood, was never caught and prosecuted, though other more senior members of the Hobart City Council were suspected. For example, the journalist called “Lynx” at the Tasmanian Times published an account of the incident which was reprinted in the Launceston Examiner on 13th December 1880. Lynx not only suggested Thomas Nevin knew which individuals were the actual culprits, but that they occupied senior positions in government and council. Tongue in cheek, the journalist not only derided the energy spent on this trivial incident – hinting at Nevin’s alleged inebriation while on duty that night when the Municipal Council had much more serious issues to resolve, such as sheep scabs – he took additional delight in punning on “cart” as in cartes-de-visite for which Nevin was better known professionally as a photographer, whose reputation should – as the pun went – be “cart-tailed” around the town for not revealing what he did know. THE GHOST, – The latest intelligence with regards to “the ghost” (says “Lynx” in the Tasmanian Mail) has made things look very black indeed for some people. The apprehension of the man Nevin has not, unfortunately, afforded any clue to the personality of the invisible spirit . Rumours are, however, in circulation which, if true, reflect in a very serious manner upon a certain Government official, and even a former Municipal magnate. I can hardly imagine it possible that those individuals would so far forget themselves and the positions they occupy as to have any complicity in the ghost scare. 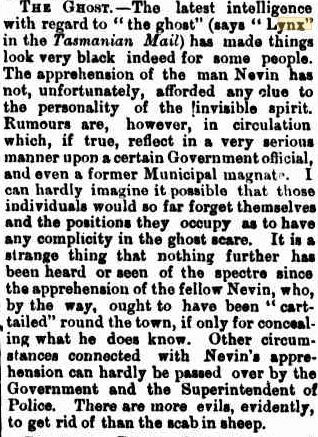 It is a strange thing that nothing further has been heard or seen of the spectre since the apprehension of the fellow Nevin, who, by the way, ought to have been “Cart-tailed” round the town, if only for concealing what he does know. Other circumstances connected with Nevin’s apprehension can hardly be passed by the Government and the Superintendent of Police. There are more evils, evidently, to get rid of than the scab in sheep. 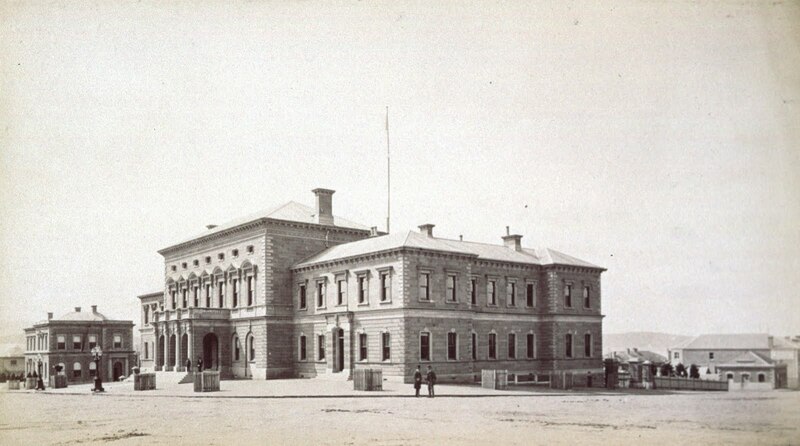 A fortnight later, on Boxing Day, December 26th, 1880, the Mercury reported that Thomas Nevin was cleared of any involvement with the ghost incident by the Police Committee of the Hobart City Council, but was nevertheless discharged from the position of Town Hall keeper because of drunkenness. On Saturday, 4th December 1880, the Mercury published a lengthy account of proceedings of a special meeting of the Police Committee at the Town Hall the previous afternoon. The Mayor, Aldermen Harcourt and Espie, and Superintendent Pedder were present. A number of witnesses were called but not sworn. Their statements were written down, afterwards read to them, and then signed by them. 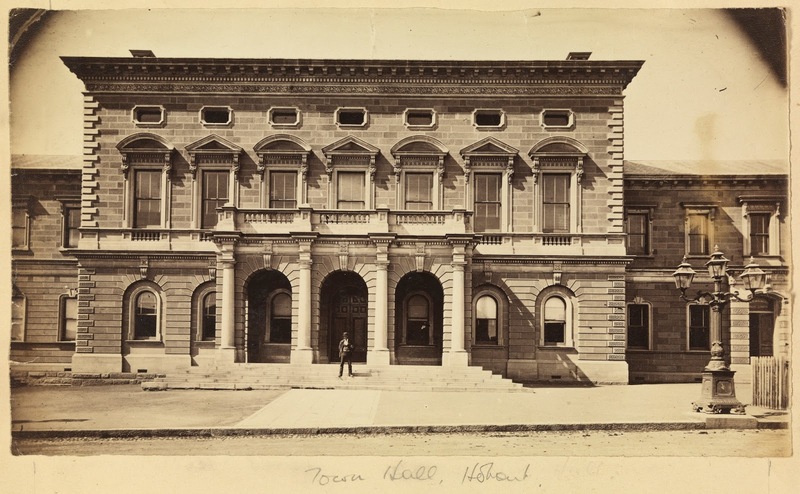 Thomas Nevin, police photographer and office and hall keeper of the Hobart Town Hall, who was the first called, was asked to give an account of what he did after 9 o’clock on Thursday night, 2nd December 1880. Thos. 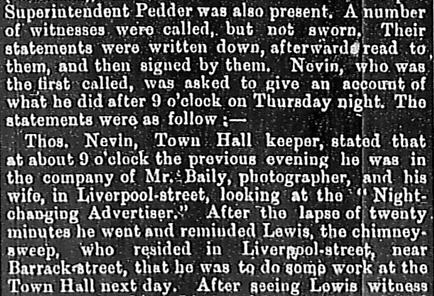 Nevin, Town Hall keeper, stated that at about 9 o’clock the previous evening, he was in the company of Mr. Baily, photographer, and his wife, in Liverpool-street, looking at the “Night-changing Advertiser.” After the lapse of twenty minutes he went and reminded Lewis, the chimney-sweep, who resided in Liverpool-street, near Barrack-street, that he was to do some work at the Town Hall next day. After seeing Lewis [,] witness [Nevin] came straight down Liverpool-street to the Royal Hotel. He was alone, and went into that public-house, where he had some liquor. Witness left the Royal Hotel at about quarter past 10 o’clock, having been there about a quarter of an hour. Witness returned direct to the Town Hall. He went into the kitchen of his house at about half-past 10 o’clock. A minute or two afterwards his wife drew his attention to the sound of a constable’s whistle. 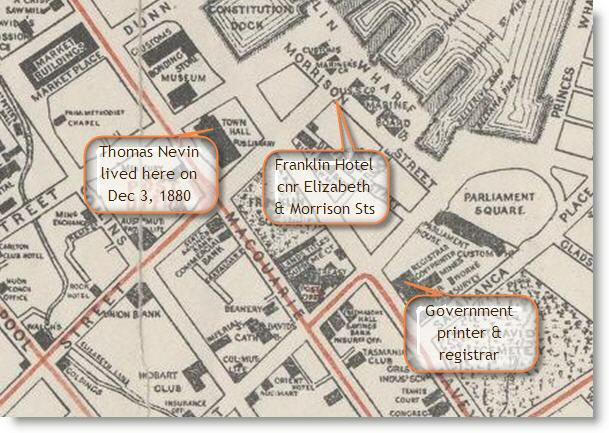 He ran down Elizabeth-street as far as the corner of Morrison-street. He then thought he heard the sound of whistles proceeding from the direction of the New Wharf. He afterwards heard the whistles sound from the Old Wharf, and went in that direction. That was at 11 o’clock, or about ten minutes past 11 o’clock. Witness ran as far as Mr. Dossetor’s mill, where he met a constable in uniform, whom he did not know. Constables Oakes and Priest were also there. He asked them what was the matter, and they said there had been some misunderstanding between a man and his wife, but they (the constables) had lost them, and all was now quiet. As witness and Constables Oakes and Priest were returning, the landlord of the Phoenix Hotel spoke to the constables. Witness and the constables returned to the Phoenix Hotel and had some drink. The party were invited in by the landlord, and he treated them. The party did not stay more than two minutes, and then walked in the direction of the Franklin Hotel. A gentleman then came down Elizabeth-street, and asked the party to have a glass at his expense. (When asked who the gentleman was, witness at first was silent, but after considering whether he would answer the question, said that it was Mr. Midwood.) The four persons (including witness) went to the rear-Admiral Hornby Hotel (Hart’s), where they had two glasses of liquor each. That was about 12 or 10 minutes past 12 o’clock. The party stayed there about 10 minutes or a quarter of an hour, when the two constables said “Good night,” and walked up George-street. Mr. Midwood walked towards Davey-street. Witness had said “goodnight” to Mr. Midwood. Being alone, and between the Custom House and the Guano Store, witness struck a match to light his pipe. The first match went out; when witness struck another, Constable Blakney then came up, and catching hold of witness’ arm, said he would arrest him. Witness asked for what, when the constable said, “You have a nose on me, and now I have got you.” Blakney was joined immediately afterwards by Constables Oakes and Priest, whom witness asked to accompany him to the watchhouse, to hear the charge. They did so. That occurred within two minutes of the time that witness left Hart’s public-house with the others. When arrested witness was in the middle of the road. There had been no one with him except those whom he had previously mentioned. Witness never saw any white object, or any “ghost.” At the time of his arrest witness did not see any constable run after a man. Neither Oakes nor Priest left witness until he arrived at the police station in charge of Constable Blakney. Witness was searched at the station – at his own request – by Sub-inspector Connor, and was afterwards discharged. Witness went home, changed his coat, and walked down as far as the Franklin Hotel on the wharf, where he again saw Constable Blakney. Neither of them went into the hotel. Witness then returned home and went to bed. On Friday morning at about 7 o’clock, witness went to Constable Oakes to ask him to be up at the police office that morning. Witness simply asked Constable Oakes to tell the truth. By the MAYOR: Witness had never been sworn in to act as a special constable except on the occasion of the disturbances which arose during the visit of Pastor Chiniquy. Witness was alone when he returned to the Town Hall from the Royal Hotel, but on the way he met a gentleman who during the course of two or three minutes conversation advised witness to go home. Witness parted with that gentleman at the Telegraph corner, and did go home. It was not true that between the hours of 10 and 11 o’clock on Thursday night, Constables Oakes and Priest took witness home in a state of intoxication. Witness had a photographic apparatus and chemicals in his possession. He had not made any ornaments of different colours for any one lately. He was not at any time on Thursday night under the influence of liquor. He did not think it was right to leave the Town Hall for so many hours as he had. He considered, however, that when he heard the constables’ whistle he was justified in going to render them assistance. Edwin Midwood stated that, after passing the Town Hall on Thursday night, he met Nevin, in company with Constables Oakes and Priest. That was shortly after 12 o’clock. In reply to a question as to what they had been doing, Nevin stated that there had been a disturbance on the wharf. Witness said, “Double back and I will see if I can get you something to drink.” The four then went, by way of Morrison-street, across to the Rear-Admiral Hornby Hotel, the other places on the way being closed. The party had some drink, and then left the public house. It was about a quarter-past 12 when they got there. After leaving the place, witness went home, going by way of Montpellier-street. Witness left Nevin about half-past 12, and the latter went towards the Custom House. Witness did not go up Davey-street. The party only had one glass each at Hart’s. Witness did not see the ghost, nor did he see the constables run after any one. George Oakes, Territorial constable, deposed that he was on duty on the wharf on Thursday night. At about half-past 10 witness heard a constable’s whistle on the Old Wharf, when he ran round as far as Pregnell’s corner, and then up Macquarie-street as far as Elizabeth-street. Then witness, finding that the sound proceeded from the Old Wharf, ran down there. He met Constable Stanley, who reported that there had been a disturbance, but the parties had gone inside. That was near Morling’s store. As witness was coming towards Macquarie-street, in company with two other constables, he met Nevin, who turned and walked with them. Nevin asked witness to see him up home. Nevin was under the influence of drink, and knew that was the case. Witness, with the others, walked home with Nevin, and on arriving near the Town Hall, at about 11 o’clock, they were met by Mr. Midwood. When asked to go into his house, Nevin would not do so. Then witness, Mr. Midwood, Nevin, and Constable Priest went to Hart’s hotel and had some liquor. The party were in Hart’s only a few minutes, and left there before half-past 11 o’clock. The party had two rounds of drink at Hart’s, witness on each occasion drinking ginger ale. When they came out of Hart’s Mr. Midwood went, witness believed, up George-street. Priest and witness walked along the front of the Custom House and Nevin walked up Salamanca Place towards Davey-street. Witness and Priest proceeded as far as the Watermen’s dock where they met two women who were conversing about the ghost. One said she could see it, and indicated that it was up near the Custom House. Witness proposed to Priest to go in the direction indicated in order that they might see for themselves. Witness and Priest went over to the corner of George-street and Salamanca Place, where they stood for some time. Witness then saw a figure in white on the path near the iron railing which had been erected between the Custom House and the Guano Store.That was about an hour after they left Nevin. Witness first saw the figure, and a minute afterwards Nevin struck a light, again revealing the figure. Nevin was in the middle of the road, but the figure was on the path. At that time Constable Blakney came from the direction of the Nautilus Hotel. Blakney arrested Nevin, while witness and Priest went in pursuit of the other man. Witness was of opinion that Nevin and the other man were acting in concert in representing a ghost. The man whom they pursued was dressed in white. The man ran up towards the Government Printing office, and witness gained upon him, nearly catching him at the corner of the building. Witness, however, fell, and the man escaped over a fence in Davey-street, near Millhouse’s. Witness, with priest, then returned to Blakney and Nevin. The last-named was taken to the watchhouse. By the MAYOR: Neither witness, Priest, Stanley, nor Nevin went into the Phoenix Hotel. It was not true that the party were invited into the Phoenix Hotel, and went in at the invitation of the landlord. Witness was quite sure that he had stated the correct time. Nevin was permitted to question Oakes, but the questions were of an unimportant nature. The witness, in reply to a remark from the MAYOR, said he had that morning had a conversation with Mr. Midwood relative to time of leaving Hart’s the previous night. Mr. Midwood told witness that morning that it was 12 o’clock the previous night night when they separated. Witness told him that it was not quite so late, but was about 11 o’clock. The witness, in reply to another question, explained that the man whom he followed wore a white gown, which was covered with a sparkling substance resembling phosphorus. Constable Henry Priest, of the Territorial Police, deposed that at about 11 o’clock the previous night he first saw Nevin, near Howard’s hotel. Witness and Oakes had previously been to the Old Wharf, respecting a disturbance there. Nevin asked the constable to see him home. Nevin appeared to be under the influence of liquor. They came up as far as the Macquarie-street corner of the Town Hall, where they were met by Mr. Midwood, who invited them them to go and have a drink. That was a few minutes after they first met Nevin. The party then proceeded to Hart’s publichouse, where they obtained liquor. Witness did not go in, but had his drink outside. After leaving Hart’s, the party separated. Mr. Midwood went towards home, Nevin went towards Davey-street, and Oakes and witness went towards the boatmen’s dock. There they saw two women who, who appeared to be frightened and were talking about a ghost. One spoke of it as being in the direction of Salamanca Place. Oakes suggested that he and witness should go round. They then went across, up into George-street, and, turning into the shade, came up by the stores. That was about an hour after leaving Hart’s hotel. They next saw a man, which afterwards proved to be Nevin, in the middle of the road strike a light. Witness at the same time saw a white figure on the footpath, near St David’s Cemetery. The figure was dressed in a white gown covered with phosphorus. Oakes and witness went in pursuit of it, and Blakney came up from the direction of the Nautilus Hotel and arrested Nevin. By the MAYOR: Witness, Oakes, and Stanley met Nevin near the Phoenix Hotel. The landlord did not ask any of them to have anything to drink, nor did they have any liquor there. Witness saw Oakes fall when he was chasing the man. To Nevin: You did not have any drink at all in the Phoenix Hotel. John Cross, licensee of the Phoenix Hotel, stated that he heard the whistles blown about half-past 10 o’clock the previous night. Between that time and 11 o’clock witness saw some persons, one of whom was Oakes, but none of them entered the house or had any drink there. Nevin was not with them. It was not true that witness invited them in to drink. To Nevin: You have never been in the house to my knowledge, and I did not treat you at my place last night. Nevin, re-called, stated that he had no phosphorus in his possession, and had never had any. John Blakeney, constable in the City Police, deposed that he was on duty on the wharf as acting-sergeant, the previous night. While walking in the direction of Mr. Knight’s stores, he saw two men at the corner. He walked over to them to ascertain who they were. As he was approaching them, both began to walk up Salamanca Place towards Davey-street. One split off into the middle of the road, and the other remained on the path on the left hand side, near the stores. Witness did not know who they were. The man in the centre of the road threw a reflection upon the one alongside the wall. The reflection was also upon the wall for a height of about 7 ft. Witness walked quickly towards the man in the road, and at the same time two men came stealthily out of George-street. Witness then commenced to run. One of those who came out of George-street said, “Come back, George.” Witness replied, “Don’t you see this fellow playing the ghost?” when the man in the middle of the road again threw a reflection upon the ghost. Witness arrested this man, who proved to be Nevin. The other two me pursued the man who had been acting as ghost. Nevin was taken to the police station, where he was searched at his own request. There was nothing that would account for the appearance of the ghost found upon him. By Mr. HARCOURT: Nevin might have thrown anything that he had away before being searched. 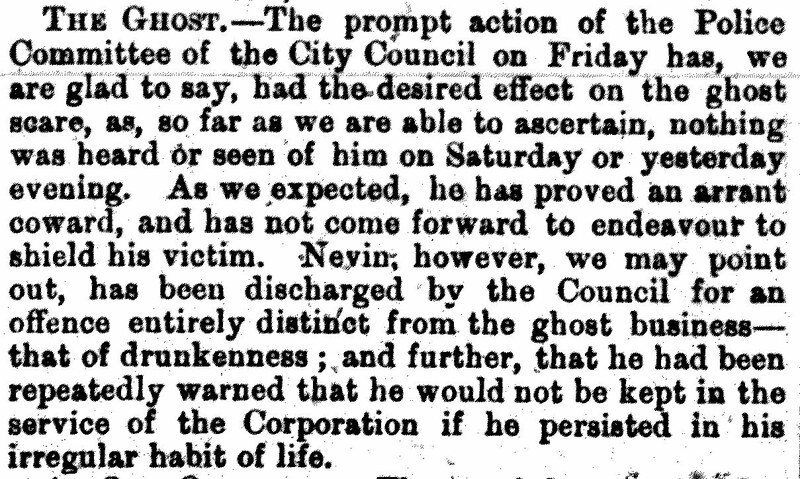 By the MAYOR: Witness arrested Nevin because he thought he had some apparatus for producing the phenomenon of a ghost. The light that was ignited was not similar to that produced by a match, but was much more brilliant. Witness arrested Nevin between half-past 12 and a quarter to 1 o’clock. Nevin was under the influence of liquor. To Nevin: You then wore the same clothing that you do now. I have no ill-feeling against you. By the MAYOR: When arresting Nevin, witness did not say, “You have a nose on me, and now I have got you,” or use any words to that effect. Sub-inspector Connor, who was on duty when Nevin was taken to the police station, stated that after searching Nevin at his own request, he discharged him. His reasons for doing so were that nothing was found upon Nevin which would account for the appearance of the ghost, and that Constable Blakney did not make a specific charge against Nevin. Witness knew that the “ghost” business had given the police a lot of trouble. He considered that Blakney simply brought the man Nevin to the station in order to obtain his (Mr. Connor’s) advice. Witness felt embarrassed about the case. Nevin was under the influence of liquor. The MAYOR: Don’t you consider that, in view of the excitement occasioned by the appearance of the ghost, and the dangerous circumstances which might arise in consequence of children, and especially women, being frightened by it, that a man arrested under the circumstances under which Nevin was apprehended, ought to be detained and locked up? Witness: Unquestionably so, if a distinct charge had been made against him. It was, however, principally owing to the fact that I knew Nevin well and the position that he occupied, and further, that if released and he should afterwards be required, he might readily be found to answer to any charge. The Clerk of Committees (Mr. W. H. Smith) produced the minute book of the Town Hall Committee, containing an entry, dated October 6th, relative to a complaint against the hall-keeper, which was then investigated. The entry was to the effect that Nevin was to at once become a tee-totaller, and if on a future occasion he were found guilty of drunkenness, he would summarily be dismissed. Nevin admitted having received notice to that effect. The MAYOR: Now, Nevin, as a last chance before we close this matter, will you not state who it was that was with you when you were apprehended by Constable Blakeney? Nevin replied that he was in the company of no one, and was equally as anxious as any one else to help catch the ghost. In reply to other enquiries Nevin persisted in saying that he did not see the man dressed in white run away. The MAYOR remarked that it was a strange coincidence that Nevin should be in both parts of the town at about, if not at the time of the actual appearance of the ghost on two occasions the same night. Nevin: I hope that you have not got it in your mind that I am implicated with the ghost. The MAYOR said that he could not help saying that he entertained very grave doubts on the question. Alderman HARCOURT thought the case was of such a nature that it would be better for Nevin to go before the Police Magistrate for him to investigate it. Henry Hart, licensee of the Rear Admiral Hornby Hotel, stated that on Thursday night several persons, including Nevin and two constables, went to his house. It was about half-past 11 o’clock, if not later. They stayed in the house for about five minutes. Both constables were served with ginger ale; Mr. Midwood and Nevin had ale. The party did not stay at his house for more than ten minutes. Witness did not think that Nevin was sober. Nevin had two glasses of ale. To Nevin: It was about twenty minutes to 12 o’clock when the party left the house. By the MAYOR: Witness believed that it was before 12 o’clock when the party left his house. A desire was expressed to recall Mr. Midwood, with a view to seeing whether he was confident that he had stated the correct time that the party left the rear Admiral Hornby Hotel. An officer was accordingly sent with an order to find Mr. Midwood, but was not successful. The MAYOR stated that inasmuch as Nevin had disregarded the caution recently administered by the Town Hall Committee, by getting drunk, he should give effect to the committee’s decision by summarily dismissing Nevin from his position as hall-keeper. The Committee decided that Nevin should be reprimanded for being absent from the Town Hall for so long a period as was disclosed by the evidence; that the testimony adduced, though strongly indicating that Nevin was in some way connected with the ghost, was not sufficient to justify the committee in recommending that any further proceedings should be taken against him (Nevin) at present; that the committee concur in the determination of the Mayor to dismiss Nevin for drunkenness. The committee further expressed their regret that Sub-inspector Connor did not exercise better judgement by retaining Nevin at the watch-house after he had been brought there by Constable Blakney on a charge of representing a ghost, especially as such representations had, during the last few weeks, given rise to much uneasiness in the minds of many citizens. Mr. Nevin, the hall-keeper, was then called in and informed of the decision which the committee had arrived at. The MAYOR also informed Nevin that he was dismissed from his position for being drunk the previous night. Extract from The “GHOST” The Mercury December 4, 1880. Transcription copyright © KLW NFC Imprint 2007 ARR.